The products which are for sale on this site are FACTORY SECONDS. They have minor cosmetic scratches and/or dents. 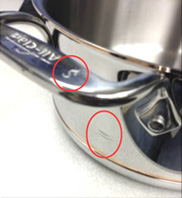 Some cookware might not be engraved on the bottom. 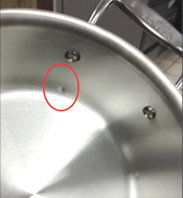 There are no defects which will affect the performance of the cookware. Below are some images of possible imperfections of a FACTORY SALE GOOD.